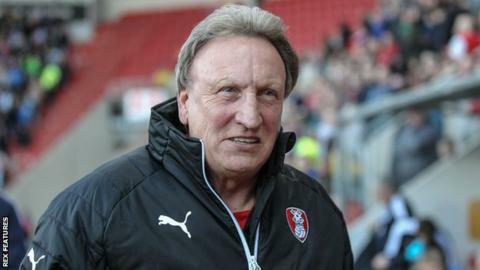 Rotherham chairman Tony Stewart says there is a "strong chance" manager Neil Warnock will remain with the Championship club next season. The 67-year-old former Rotherham player took charge until the end of the season in February with the club six points adrift of safety. But the Millers drew 0-0 at Wolves on Saturday to ensure survival. "I think it's dotting the i's and crossing the t's, and we'll sail through that," Stewart said. "We're in serious talks, and I think that we'll develop the talks, and I think there's a strong chance that Neil will be with us next season. "He has enjoyed the stay with us - I think he wants to stay with us, and we want to stay with him." Rotherham are the 11th league club managed by Warnock since he began at Scarborough in 1986. He told BBC Radio Sheffield on Saturday that he had yet to make a decision on his future. "It's only fair that I take a step back really because it's going to be a very difficult job next year," he said. "It's not one that I'm afraid of. Right from the start I said to Tony Stewart, let's sit down when we're safe, because there's obviously going to be other clubs interested, we're not daft. "I've never kept anything from the chairman, I'll tell him everything that's going off. We'll sit down probably at the end of next week or the following week and see where we are."